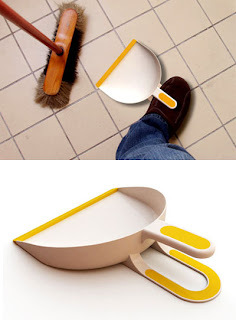 From designer Matthias Lange and through Yanko Design and Gizmodo, this foot-mounted dustpan at first seems to be one of those no-duh, why-didn't-I-think-of-that delights we're all lucky enough to find every once in a while, then regret that we didn't make the million bucks off the idea. However, photos can be deceiving, and this one certainly is - we're only seeing a snapshot of what is, in reality, a more involved usage scenario. What we see in the photo at left is the good part - while you're sweeping, you can stand upright while your foot holds the dustpan firmly in place. But before that, you had to get the thing onto your foot - and unless you're particularly graceful and coordinated (in which case you wouldn't have spilled anything that needs to be swept up in the first place? ), this probably involves the dangerous dance of hopping around on the other foot, flailing out for support to keep your balance, and maybe even spilling some more stuff to sweep up while you're at it. Then after the sweeping, you have a full dustpan attached to your foot - a loaded weapon waiting to spill its load on the way to the garbage can, if you so much as tilt your foot the wrong way or walk a bit too swiftly. Finally, the removal - you have to either bend down for this one (the action the product was designed to eliminate in the first place), or demonstrate the grace of a ballerina-gymnast-ninja to get the pan up to your hand or the trash can while remaining level. This seems to me a feat more appropriate to fun and games at a company picnic than menial chores around the home. But at least it looks nice, even if its use isn't quite thought all the way through. Lots of products are sold this way, and many of the buyers/users are happy with the tradeoff. Not to be too harsh, but maybe Yanko's tagline should have clued us in from the start: "Form Beyond Function." I still think there could be a way to make this work. Maybe the original design emphasizes form over function, but that doesn't mean potential for improvement doesn't exist. I mean, as I was sweeping the kitchen yesterday, I was thinking how awesome it would be to have one of these (minus the problems that you highlighted). Definitely true, Lucy, there absolutely could be ways to make this work. Any ideas? I'd love to hear'em!